An environmental crisis of epic proportions is occurring just outside our backdoor, but we must look closely to see it. Our universe of insects is quietly and quickly disappearing. Entomologists have long understood that the web of life which supports all creatures on Earth will unravel without insects. Those pesky bugs we complain about are the most common living species on the planet. There are 1.5 million known species, and together, these insects exceed three times the number of all other animals combined. Yet, in typical human fashion, we undervalue their abundance. We want to eradicate insects; we attack them with pesticides. We overlook their contributions to our food supply, clothing, medicine, soil health, scientific endeavors, nutrient cycling, intricacies of ecosystem balance, and beauty. Upon their fragile bodies rests the weight of life’s taxonomic hierarchy. Writing in The New York Times Magazine, Brooke Jarvis shared these alarming statistics: “The population of monarch butterflies fell by 90 percent in the last 20 years, a loss of 900 million individuals; the rusty-patched bumblebee, which once lived in 28 states, dropped by 87 percent over the same period.” The article’s title—“The Insect Apocalypse is Here”—signals the seriousness of the situation. Habitat loss and chemicals are two scourges of the insect world. The good news? We can help the bugs survive, starting with what we choose to plant in our yards. thus helping defeat the chemical culprit of insect decline. Native plants generally survive in local conditions—including the rough winter we just had—better than non-native ornamentals. Some non-native plants become invasive, degrading habitats and compromising wildlife and the biodiversity necessary for healthy ecosystems. So when bee colony collapse disorder or fewer swallows returning to Capistrano cloud our thoughts, remember that a mysterious connection of strands weaves the native plants in our backyard to the larger web of life—and native flower power can collectively make a difference, one yard at a time. Angela Minor has lived, traveled, and birded the U.S., Caribbean, and seven European countries. A former teacher and small business owner, she writes for travel publications including Blue Ridge Country, Smoky Mountain Living, and Ft. Myers Magazine; serves as field editor with Birds & Bloomsand as “Park Watch” Beat Writer for 10,000 Birds; and authors the Bird Watcher’s Digeststate park birding series. In addition to Nelson Salisbury, Julie O’Donald and Jane Ostericher shared their expertise for this article. For the hardiness zones 8b to 9a in the Pacific Northwest, our experts recommend the following native species to start attracting birds and insects. Yellow monkeyflower(Mimulus guttatus). Blooms March through August. One- to three-foot bush or can be spindly. Attractive to butterflies. Seablush (Plectritis congesta). Blooms early. Dense cluster of bright pink to white flowers. Special value to native bees. Farewell-to-spring (Clarkia amoena). Blooms June through August. Pink and purple showy cup-shaped flower. Special value to native bees. Nodding onion (Allium cernuum). Blooms June through August. White or pink clusters atop a leafless stalk from bulbs. Perennial. Attracts hummingbirds, butterflies as a nectar source, and beneficial insects that prey upon pest insects. Western columbine (Aquilegia formosa). Blooms May through August. Hundreds of nodding red and yellow flowers over two- to three-foot bush. Hummingbird favorite. Oregon sunshine (OR). Blooms June through September. Yellow sunflower heads on sprawling mounds 4-18 inches in height. Attractive to butterflies, special value to native bees. Poverty oat grass (Danthonia spicata). Blooms May through July. Delicate green at top of perennial bunchgrasses. Attracts butterflies and moths, acts as larval host. Tufted hairgrass (Deschampsia cespitosa). Blooms yellow in June. Delicate stalks in clumps. Bird forage, larval host. Roemer’s fescue (Festuca rubra). Blooms yellow from April through September. Field perennial. Attracts birds, serves as structural host plant. Orange honeysuckle (Lonicera ciliosa). Blooms May through July. Large, dense terminal clusters of orange and yellow flowers. Running vine up to 18 feet in length. Hummingbird favorite, special value to native bees. Hairy honeysuckle (Lonicera hispidula). Blooms May and June. Usually pink, can be white to rose and purple with yellow tinge, red fall berries. Loose twining shrub from three to twenty feet. 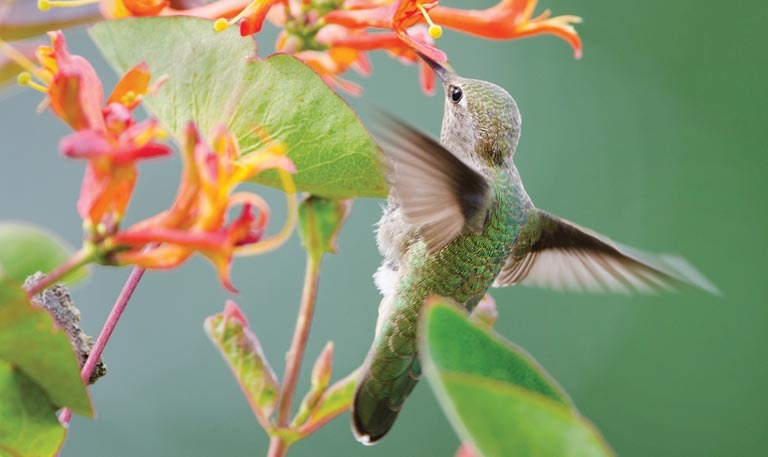 Flowers attract hummingbirds as nectar source, berries attract birds. Trailing blackberry (Rubus ursinus). Blooms white and pink March through July. Vine-like perennial groundcover. Highly sought after by birds, special value to native bees and bumble bees, nesting material for native bees. Red-flowering currant (Ribes sanguineum). Blooms white, pink, or red in March and April followed by blue/black fruit. Four- to ten-foot erect shrub. Nectar source for bees (special value to native bees), butterflies, and birds. Western serviceberry (Amelanchier alnifolia). Blooms white April through June followed by blueish berries. Four to 15 feet tall by six- to eight-foot wide perennial. Multiple uses (nutritional and medicinal), attracts birds and butterflies, larval host plant, special value to native bees. Evergreen huckleberry (Vaccinium ovatum). Blooms pink bell-shaped flowers March through May followed by purple/black berries. Two to six feet tall with shiny leaves. Birds and mammals eat berries, special value to native bees. Bitter cherry (Prunus emarginata). Blooms white and pink in April and May followed by small red fruit. Multi-stemmed or single trunk reaching 30 feet tall. Attractive to and larval host for several butterflies, special value to native bees, nectar source, berries for birds (especially Evening Grosbeaks). Vine maple (Acer circinatum). Blooms March through May followed by red fruit. Dramatically colored flowers, and bark, can reach 40 feet with 25-35 feet spread. Attractive to birds and butterflies, larval host to latter. Shore pine (Pinus contorta var. contorta). Blooms April and May with cones following. Mid-sized tree up to 50 feet, grows well in groves and as hedges. Nuts attractive to birds, nesting cover.